How does an energy-efficient greenhouse work? An energy-efficient greenhouse allows you to manage the right indoor climate at the lowest energy cost. Agrithermic approach is a combination of reducing energy needs, efficient energy production and localized heat distribution at low temperatures. 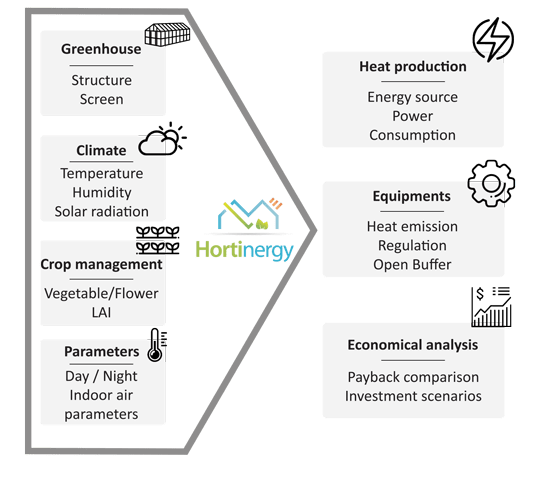 The Hortinergy® energy calculation software is tailored to the specifics of greenhouses and is used to accurately scope your needs. It takes into consideration modern equipment (biomass, open buffer, dehumidifier, etc.) and the impact of vegetation (evapotranspiration) on heating. Ready to save your money ?